"We'll Make It Happen, You Make It A Home!" Wilkes County, North Carolina is nestled in the foothills of the Blue Ridge Mountains. 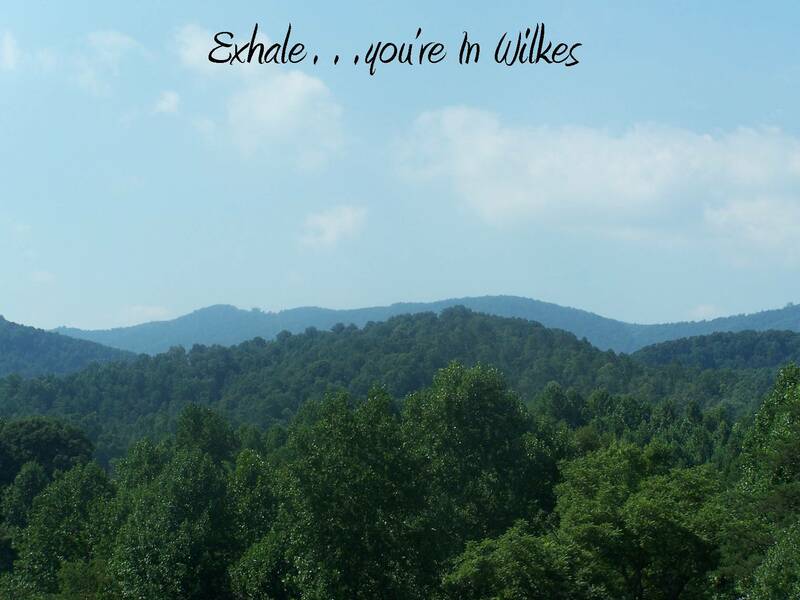 Wilkes County is located on the eastern slope of the Blue Ridge Mountains, part of the Appalachian Mountains. Elevations range from 900 feet in the east to over 4,000 feet in the west. Thompkins Knob has an elevation of 4,079 feet, the highest elevation in the county. Stone Mountain State Park is located in the northern part of Wilkes County. It is one of the most poplar state parks in North Carolina. It offers rock climbing, camping, hiking, and trout fishing. The Brushy Mountains form the southern part of Wilkes County. Wilkes County's largest river is the Yadkin River. Three major streams flow into the Yadkin River; they are the Reddies River, Roaring River and Mulberry Creek. Later Wilkes County formed the W. Kerr Scott Dam. W. Kerr Scott Lake is the largest body of water in Wilkes County offering boating, swimming, fishing (bass), family picnics, camping and waterskiing. Wilkes County was known as the "Moonshine Capital of the World". Men made a living in Wilkes County delivering illegal homemade liquor to larger towns in North Carolina. This illegal liquor was bootlegged as far Florida. This often involved outrunning the police and federal agents in a car chase. Due to this Wilkes County became one of the birthplaces for NASCAR. The North Wilkesboro Speedway was one of the first NASCAR track. Junior Johnson, one of the good ole boys who ran moonshine until he got into Winston NASCAR racing, where he went on to become a national champion with drivers like Freddie Lorenzen, Cale Yarborough, Darrell Waltrip, Benny Parsons, Jimmy Pardue and Bill Elliott. Wilkes County offers wonderful education. With four high schools, four middle schools, thirteen elementary schools and even private schools. Wilkes Community College is a two year college. Wilkes Community College is also the home of Merlefest, poplar bluegrass and folk music festival. Beginning on Thursday, in the last week of April and lasting through Sunday, visitors from all over, arrive year after year to participate in this event. Various music artists such as Willie Nelson, Dolly Parton, Nickel Creek, Alison Krauss and the founder of the festival, Doc Watson have performed at the Merlefest. What began as a local bluegrass festival has grown into a major event for music lovers of all ages. With strong musical roots, Wilkes County holds an annual Battle of the Bands. This event is held in downtown North Wilkesboro in September. A rock festival featuring around 20 bands competing for cash, or even a record label. In May of each year, Wilkes County celebrates the wine industry with the Shine to Wine Festival held in downtown North Wilkesboro. Wine making is becoming large industry for Wilkes County. On the first Saturday in October of each year, Wilkes County holds the Brushy Mountain Apple Festival. People gather and fill the streets in downtown North Wilkesboro. Booths are set up to display art, crafts, food and woodwork for purchase. Entertainment is also provided, from dancing to singing. Sherrill Faw Realty, LLC serves Wilkes County, NC. Cities include: Wilkesboro, North Wilkesboro, Moravian Falls, Millers Creek, Purlear, Roaring River, Ronda, Elkin, Jonesville, Boone, Blowing Rock, Deep Gap, McGrady, Wilbar, Hays, Traphill, Boomer, Beaver Creek, Antioch, Brushy Mountains, Edwards, Elk Creek, Jobs Cabin, Lewis Fork, Lovelace, Mulberry, Walnut Grove, Union Grove, Rock Creek, Stanton, Somers, Foscoe, Franklinton, Galax, Independence, Jefferson, Darby, Davidson, Dobson, Fleetwood, Conover, Creston, Crumpler, Eunice, Hamptonville, Lake Lure, Lansing, Banner Elk, Beech, Beech Mountain, Colfax, Concord, Booneville, Charlotte, Chestnut Hill, Clifton, Glendale Springs, Laurel Springs, Lenior, West Jefferson, Vilas, Volney, Warrensville, Todd, Union Mills, Valle Crucis, Sparta, Statesville, Taylorsville, Thurmond, Nebo, Obids, Piney Creek, Roaring Gap, Saltville, Love Valley, Low Gap, Marion, Mocksville, Morganton, Mouth of Wilson, and Ferguson. Subdivisions: Spring Mountain Preserves, Chestnut Mountain Farms, Doe Mountain, Bell Mountain, Sutter's Ridge, Bull Mountain, Deer Run, Highland North, Ivy Ridge, Leatherwood Mountains, Patton's Ridge, Buck Mountain, The Farm, Peterson Pond, Topview, Robin's Landing, Magnolia Place, Briar Creek and Poplar Trail. Sherrill Faw Realty, LLC is here to help you with all your real estate needs from buying or selling. We can help you find all kinds of property which include the following: lake front lot, lake front land, mountain home, mountain home and land, real estate in Wilkes County, NC realtors, chicken farms, farms, lots, land, foreclosures, NC Foothills, North Carolina mountain home, Western North Carolina and commercial property. Look no further……..You have found the realtor that can do it all!